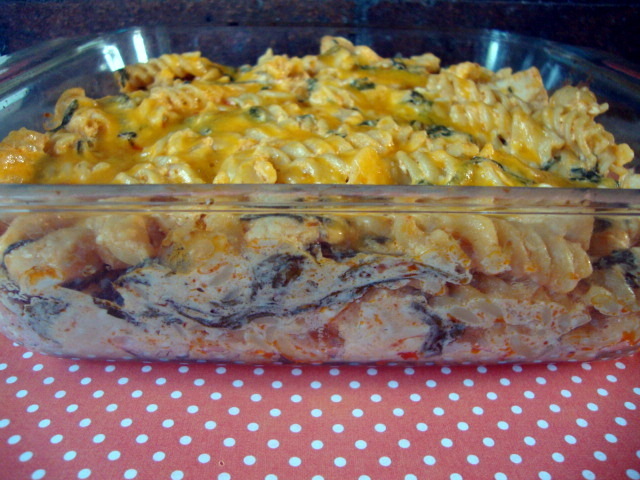 This casserole is the savory recipe that I’m most proud of, it’s just that good. I can’t pat myself on the back too hard though, it’s difficult to fail when Buffalo sauce and blue cheese are involved. This is spicy, creamy, cheesy, and even a little bit healthy. If you prefer ranch with your wings you’re crazy go ahead and sub that in for the blue cheese. I use Anchor Bar’s Mild Buffalo Wing Sauce. Preheat oven to 450 degrees Farenheit. Set up your colander or strainer in the sink and put the raw spinach inside. Cook pasta al dente according to package directions. Pour cooked pasta over the spinach (the heat will “cook” it) and return pasta and spinach to the cooled pot when all of the water has drained off. While pasta is cooking, melt butter in a sauté pan over medium-high heat. Add chicken to the pan and cook until done, about 3 – 5 minutes on each side. Add ¼ cup buffalo wing sauce to the chicken and cook 1 more minute. 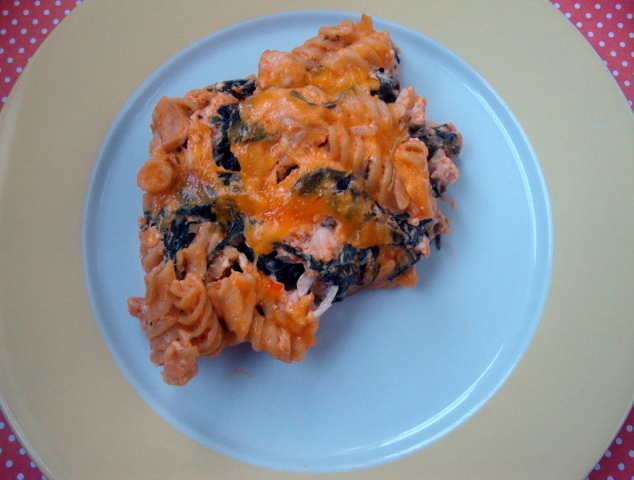 Remove chicken from pan to the pot with the pasta and spinach and reduce heat to medium-low. Combine cream cheese, blue cheese dressing, and remaining ½ cup buffalo wing sauce in the pan. Heat until melted, 4 – 6 minutes. Remove pan from heat and pour sauce over the pasta. Stir until all ingredients are well-combined. Pour the pasta mixture into an 8×8 inch casserole dish. Top evenly with the shredded cheddar. Bake 8 – 10 minutes, until cheese is melted and browned.